I’ve come to believe that everyone should have a purpose for themselves. Companies do it all the time. They spend time figuring out why they exist, what they’re trying to accomplish, how they’re going to get there, and what values they will embody to guide the team along the journey. But so rarely do people actually define these things for themselves. And honestly, isn’t that more important than a company doing it? I believe that I have a responsibility to have an out-sized, positive impact on the world. What does that mean to me? Well, simply put, everything I do should somehow make the world a better place. The kind of husband and father I am to my incredible wife and family absolutely impacts the good I do in the world. Just take my kids, for instance. The more they grow up with a deep sense of empathy for others, the more likely they will be caring, good people. The more they see me do things like 48in48, the more they’ll aspire to do such things when they grow up. That’s my son, Zac, who came with me to 48in48 Boston this year. And we’re standing with the incredible Adrianne Haslet-Davis, the keynote speaker at the event. I love being an entrepreneur, so the businesses I build should find a way to do good in the world. They should help people become better versions of themselves, and they should provide me with a source of income to allow me to do more good. I love mentoring young leaders and startups. Having them see that I can find time in my life to give back might just rub off on them. Then, as they gain success, they will hopefully find a path toward giving back as well. Obviously starting and supporting nonprofits is my most direct and obvious focus on doing good in the world. 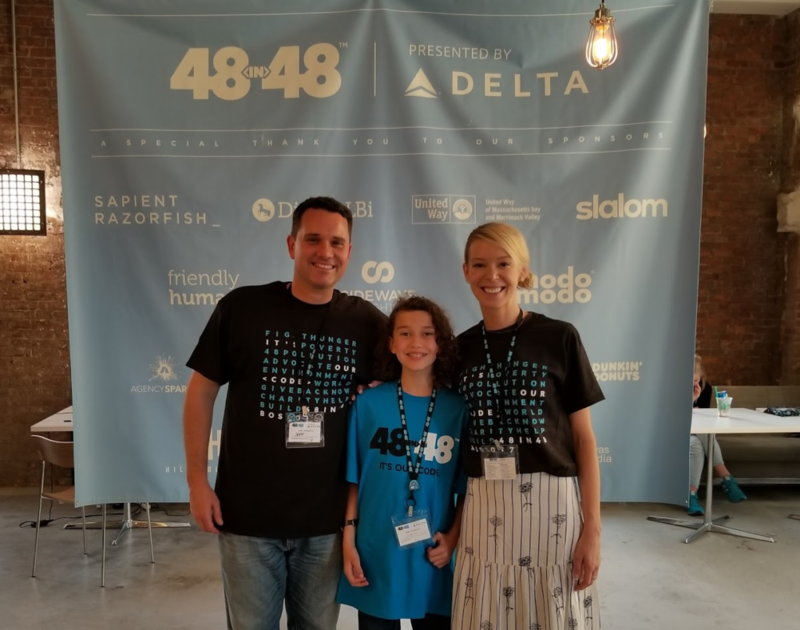 Creating 48in48 and serving on the many Boards that I’m a part of are how I do that now. So that’s it. Everything that I do should point toward doing good in the world. It’s a mission that I’m holding myself to, and I hope to make a little progress every day. So what is YOUR purpose? Do you have that defined? If not, try this exercise and see if it helps you get there. And it doesn’t have to be a “doing good” type of thing. Maybe your purpose is to provide for your family. Or create amazing products. Or build thriving businesses. Whatever your purpose is – and please share it! – my hope is that you can define it and then go after it with everything you have. If you do that, you’ll have no regrets and you’ll live a life worth living.